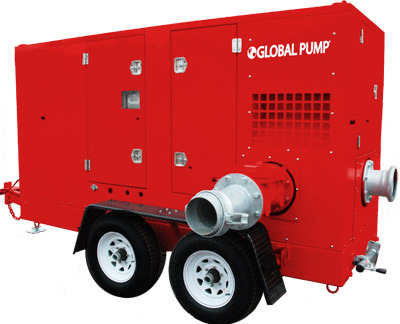 Global Pump High Performance Trash pumps are specifically designed to effectively handle a wide range of liquids from water and sewage, to sludge that can contain solids and other material. Global Pump High Performance Trash pumps, with advanced enclosed impeller design, provide a dependable, highly efficient solution in a completely automatic priming pump. Available with a variety of priming systems, including the Global Pump Auto Prime automatic priming system (compressor-fed venturi priming) or a diaphragm priming system. Pump casings hydrostatically tested to 50 psig (345 kPa) above the peak casing design pressure. Standard engine control panel provides preset emergency shutdown protection and allows the addition of automatic level control. 12-gauge Galvannealed-Steel (or optional stainless steel), double-sided-galvanized sheet panels insulated with a 1.25" thick acoustical foam barrier fire retardant composite reduces noise level to no more than 68 db at 30 feet (9 m). Designed for upward exhaust of combustion gases and cooling air. Panels are removable for maintenance and repair. Panel doors, with locks, for access to the pump, engine, priming system and controls for routine servicing, lubrication and fueling.